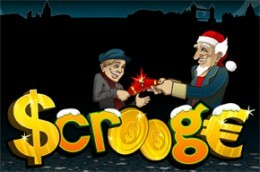 Scrooge is an online video slot inspired by the Charles Dickens novel with the same name – Scrooge. The game is a 5-reels and 50 paylines video slot powered by Microgaming. The big jackpot is worth 120.000 coins. The game offers to its players wild, free spins and cash prizes. All the symbols are theme-related and they include Scrooge himself, the ghosts of Christmas pasts, present and future, and Tiny Tim. Other symbols include a set of keys, a locked ledger, a pile of cash, a clock, and a safe. The wild symbol is represented by a wreath of silver coins, while the scatter symbol is the door knocker.